A very interesting post about blogs, bloggers and their blogging. Now I’m feeling something. Something of a nerve to write a messy piece about many things at once. Thing number one, about blogging habits. In her recent post Zhenya Polosatova asked her readers the questions that brought about a storm of responses, both in the comments and as separate blog posts. It’s amazing just how easily *some* bloggers are drawn into analysing their blogging ways, how excited they get. Well to say “they” would be wrong since I’m normally the very first in that eager line. Here’s my short (see Thing number two) take on the topic. Last year my blogging habits underwent quite an upheaval. I blogged in a cafe, on a beach, on the floor, in a train station, on a couch, on a bench in the park, on a tatami mat (at home at my desk being the habit). I blogged with people and alone (which is the habit). I blogged both in daytime and nighttime (the latter being the habit). I posted without liking my writing (… liking or disliking can’t be called “a habit” I reckon))). I blogged about teaching and about things far from it. I really don’t know what else I can do. All in all, I’m more than pleased with how my blogging is developing and I feel desire and energy to proceed the way that will feel right. One new ritual I’m looking forward to establishing this year is going through my WP Reader once a week to balance my blog reading. Hope to see you there. Thing number two, which tries to devalue part of Thing number one. In this post I say I blog for my own pleasure but hope for shifts in the classroom. Then in no time I come up with a follow-up which is 800 more words about blogging and writing. Here I keep mentioning myself and my plans for writing in what some say are most powerful parts of a blog post – opening and closing paragraphs. If you need more proof of how obsessed I am with writing about (my) writing, don’t hesitate to look here, check this out and click this link. First I wanted to make a difference. Then I turned into an ego-busting persona. Hedonism? I’m *possibly* done with it. At least with the part which whispers to me that it can be interesting to anyone to go on reading after my “I think that…” At the moment I think that I could think of writing something more exciting. Thing number three, about us Russians. I am, just like Vedrana Vojkovich here, continuously stunned as I check my blog stats and see that the overwhelming majority of my readers are from Russian Federation. Who are you?! I know a few and I am grateful to them for being ever supportive, plus last year several times my former students left a line or two and it felt great. Otherwise, I am unaware of names and faces of my ghost Russian readership. In any case, everybody is most welcome. Ludmila Malakhova, who is a fantastic lady from Yekaterinburg that I had a real pleasure to meet twice at the Forum I mentioned earlier and who suppported me in a very indecisive time with just the right words. Thing number four, untitled for lack of creativity. Which blogs do you follow? How do you find these blogs in the first place? There are so many, how do you keep up? Which platform would you recommend to start own blog? Should we blog in English or Russian? Thing number five, Final Thing, or the Thing of Importance. It’s been on my mind lately. Namely, from December 2nd. What else can we, English teachers who are united by ELT blogging addiction, blog about? I took immense pleasure in taking culture notes in my travels and then publishing this post, as well as other, exclusively personal posts that I had out during my time in Asia. I was thrilled to NOT have it in my mind to make any connections to teaching/ learning, because frankly, I don’t believe a teacher should always, at all times in all situations think about his/ her classes. And while I’m sure we/ you all have our interests that might or might not be reflected in the classes we/ you teach, I don’t really know much about them. I do imagine, though, that there are words to be put into long beautiful/ eloquent/ funny/ witty/ touching etc sentences. What would you blog about if not ELT? What makes an ELT movement launch? Two teachers in different time zones and a Facebook chat. I had planned to work on a certain, very simple coursebook text with one of my lower level groups that day anyway and it was an attractive opportunity to try out something new. Due to my poor time management and the fun we were having discussing the videos my students had watched at home as part of their home task, we only got a chance to do this activity with me modelling it, that is being the reader and them being the listeners. It actually was very good! The students, who are normally incredibly energetic and difficult to manage, were all ears and very active in asking questions and trying to guess the words. After they put the 10 words down I asked them to reconstruct the chunks in which these words were used in the original text. And they nailed it! That was a really positive note to finish our class both for me and for the students. #mikemob was a smooth success! And THAT was how the #flashmobELT movement was born. STEP 1. Once a day/ a week/ period of time you like one teacher shares a description of an activity to be done at a lesson. It’s probably convenient to keep all activities in one place and we suggest an easy way to do so – a Lino wall. This is the link for now. Don’t forget to share it then on Twitter, Facebook, blog or a personal mail to a teacher friend. Tag it #flashmobELT and if you wish create your own hashtag (e.g. #mikemob, #achanmob, etc) to make sure your activity is given enough credit while going incredibly viral. STEP 2. Willing teachers try this activity in class. STEP 3. Blogging teachers write a blog post about their experience. STEP 4. Enthusiastic teachers catch the bug and keep the ball of the #flashmobELT Movement rolling. This is our thinking. We genuinely hope you support the movement by joining in! The LINO WALL to post your activity is HERE. “What does it feel like to be…” The Ultimate Comment Mashup #2. I asked a year ago in my Posterous blog and received the following comments. I’m now securing their safety here in this post. Read, discuss with your students (like I’ve been doing), enjoy the insider views. In the first place I feel like George Mikes: you can be British but you can never be an English! Perhaps your question isn’t directed at people like me who aren’t British by birth, but yes, I am British, and, what’s more, a British passport is the only one I have! 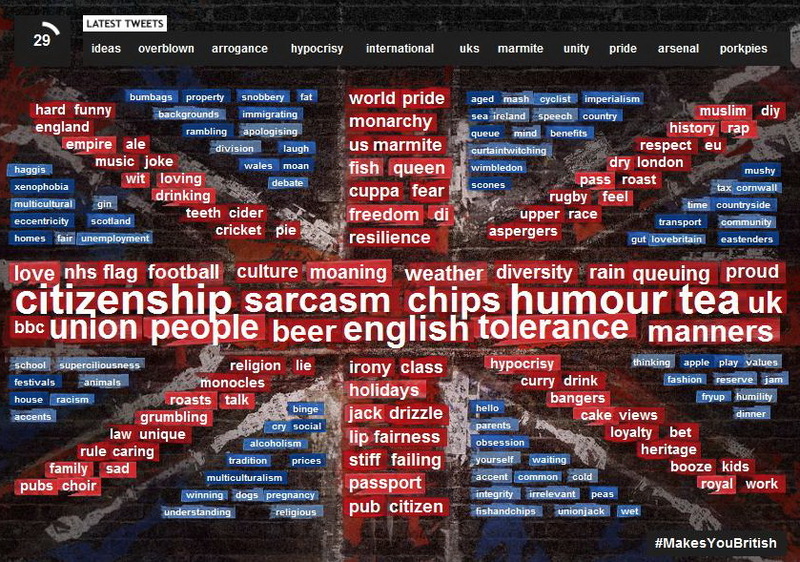 So, what does it feel to be British? In my case, well, I feel more like a global citizen rather then British, to be honest. Right now, I feel more at home in Las Palmas than anywhere else, but put me in London, and in no time, it feels like home, too. Strangely enough, I feel more British when in Britain; here, I just feel…well…foreign! So, how else do I feel? I don’t really know. Do I have any so-called British habits? I have tea in the morning and I rarely have it again during the day. I almost never have English breakfast nor Sunday roast here. Language and music wise, I feel more British than anything else, but I’m talking about 60s and 70s music and not what comes out today. I follow more Spanish sports than British and I’d sooner cheer Nadal and Alonso than Hamilton or Button. So, I guess I’m not so loyal now. For me, Britishness can be a double-edged sword. On the one hand, it gives me a sense of history and culture stretching back well over 2000 years, and further back if you count pre-Romans. This richness in the environment around me is fascinating, and I’m constantly discovering new parts of my culture and country. As a country with a lot of immigrants, Britishness is also being challenged (in a good way) and our culture is becoming much more receptive to other races and cultures, up to a point. Having the passport I have has also given me an extraordinary amount of opportunities, for which I am very grateful. On the other hand, being British abroad can be very embarrassing, because the reputation of Brits as alcoholics and/or hooligans seems to be spreading rapidly. It has already spoiled some places, although hopefully not beyond repair. Many Brits also seems to have the ‘insular’ mentality that takes it’s name from living on an island. Despite having a diverse culture at home, many Brits still think everyone should speak English and adapt everything they do to the Brits around them, whether at home or abroad. For me, this can make me feel embarrassed about being British at times. The first thing that popped into my head was sense of humour and self-deprecation. I have been living in France for about 6 years and this aspect always stands out to me. But as the first response mentioned I do feel more of a world citizen than British. Maybe that is to do with my background – Sri-Lankan Tamil family, born in Ghana, grew up in Wales, married to a French! I wonder what our soon to arrive baby will feel like when he gets asked a question about culture and nationality? 1. Humour – it’s in every conversation, whether silly, sarcastic, satirical or surreal. Wordplay is a national sport and we’ve produced some truly amazing comedy series (imho). One of the few things that makes me really proud to be British. 2. Reservedness – we’re an excessively private people. We don’t like people standing too close, making too much noise, asking personal questions or coming to our house unannounced. I can see why others often think we’re cold! 5. Tea – tea solves EVERYTHING. I’m a pretty bad Brit because I take mine black – the commonest way is with milk and sugar (also known as ‘builder’s tea’). 6. Multiculturalism – this is the double-edged sword that Sandy mentioned above! – our cities, especially London, are amazing because of the diversity of people in them. But a big part of the reason for that was probably colonialism, which is something most British feel still feel uncomfortable about (see no 3 above). 7. Eccentricity – we’re not comformists. We collect weird stuff, celebrate weird stuff and wear weird stuff. It means we produce interesting artists, musicians etc though, and I love that. 8. Freedom – having lived in other parts of the world, I now value how free I actually am when I’m at home. I can marry (or not) whoever I like, I can live where I want, say what I want in public, practice any religion or none…these are all things to be thankful for. 9. Passive aggression – linked to no 2, maybe, we hate direct conflict and hardly ever say what we really mean. Debates in the House of Commons are a brilliant example of this! 10. Pessimism – we just can’t achieve the perkiness of our American cousins. We think every new project is doomed to fail and we love to have our pessimistic predictions proven correct (‘Typical!’ is a particularly British refrain). This is really interesting question Ann, although I’m not sure you realise just how political it is, especially at the moment! As an English person, I consider myself both English and British. However, that is because I consider nationality to be a large part down to geography. Simply, I was born and lived most of my life in England, which is part of Britain. That’s the land mass where I was born and I can’t claim to be anything else. Some people might claim to be only English, but I would dispute that based on my opinion that they don’t have a choice. They were born there, and that’s it. This might sound obvious, but there are people in Scotland (and Wales to a lesser extent) who wouldn’t consider themselves British because they see Britain as a political entity. Of course, I can’t deny that, it is by definition a “United Kingdom” of nations under one government. However, I don’t feel that this kind of excessive patriotism is particular useful. I understand why people want to define themselves culturally in relation to the place where they were born, it’s a useful way of creating a shared identity. My problem is when patriotism slips over into jingoism (from “my country is great” into “my country is better than yours”). This, for me, is dangerous and lies behind so many pointless conflicts around the world. I should point out that I’m not classifying all patriotism in these terms. Personally, I don’t get much out of it, but if other people want to be that way, it doesn’t bother me. So the point of this is (yes, there is one 🙂 ) is that as an English person I’m proud of our culture and the things we have given the world courtesy of Charles Darwin, William Shakespeare, Isaac Newton, the Beatles, Tim Berners Lee & Emmeline Pankhurst and so on, but I don’t feel I can take any credit for that and I’m aware that most countries and cultures can also point to their own equivalents of equal stature. So do feel I British? Yes, but it doesn’t mean much to me, but then neither does being English. The more I travel and live abroad, the less useful it becomes as I see it as fairly restrictive group of stereotypes, some true, some not, that don’t really serve me any purpose. Coming from Scotland I would say that my attitude towards Britishness is a rather distant one. Even though I no longer live there, I don’t think that changes all that much. My experience is that many Scots feel something similar. I can’t myself remember the last time hearing a Scot say “I’m British” unless they were publically expected to do so. I think we shouldn’t generalise but at least some of the English community feel more comfortable with their Britishness. Many thanks to the wonderful Brits who took the time to leave a comment and, well, educate me and my students in the sense of giving very genuine explanations to their feelings of belonging or non-belonging. One won’t read that in culture studies course books. I’m grateful. If you think you have something to say to the question I posed – please do! “What does it feel like to be…” The Ultimate Comment Mashup #1. A year ago I was working on the country studies course book which is now successfully published at my department and can be found on some library shelves. It’s quite probable that nobody is going to teach with it except for me and a couple of my colleagues, yet this experience was invaluable to me. In the meantime, I simply cannot put up with the fact that with the official death of Posterous I’m going to lose all those precious replies for good…So I’m reposting them here in this post. For my own sake, for the sake of my students, for anybody who’d pop over here and find it exciting. Here we go. I’ll plunge in first, and feel free to shoot me an email with any further questions/ideas/thoughts. To be American, in these modern days, to me, means to be an individualist. To have positive relations with many friends, but to be most concerned with what is your current project, or your current relationship. While we have community, our ties are less so than other countries I’ve visited. This is visible both in our social customs as it is in our governmental policy. To be American, for me, also means to be confused at times about a pop culture that exports itself all over the world, sometimes through its art, sometimes through its business, and sometimes through its national acts of agression. Yep, I said it and no I’m not proud of it, though nor do I identify with it that much as I see myself as a global citizen these days more than an American. After living in Germany and for a stint in Greece and traveling to 22 countries, I have really thought about this question. It feels strange in a way because I feel as if we have the most freedom in the world and so many opportunities to accomplish great things but we rarely take hold of those opportunities. I think we are so blessed to be born in a place where we do have the ability to accomplish so much despite our economic situations in the US. What does it feel like to be an American? What a difficult question! I can tell you what it feels like to be an American for me. I should preface this with some background information, as America is so diverse that how I feel about it is very different from other people’s views. Obviously, I am a white female. I grew up in an affluent area on the east coast. I am educated (currently working on my graduate studies), and I am employed. I am a wife, mother, and teacher. What does America feel like for me? Competitive. I feel an intense need to compete, and I believe it is, at least in part, cultural. America is very competitive. We place a strong value on innovation and success. Part of the reason we have such disparity between our rich and poor is our ideology that people should “pull themselves up by their boot straps,” meaning, make your own success. Take care of yourself. Be strong, be creative, be the best. Never show your weakness and always win. Curious. I am genuinely interested in other cultures. I love to read novels about various cultures, and I love participating in global collaboration. America, though we have such diversity, is somewhat isolated. Consider that in Europe, one can visit ten countries in the time it takes one to cross from our east to west coast. And each country has it’s own history, culture, and language. Yes, we have many immigrants, but America has traditionally asked them to lose their ethnic identity and become part of the “great melting pot.” I believe that has changed significantly in recent years, but that is the America I grew up in. Compassionate. Americans want to save the world. We are generous and compassionate. The problem is, we don’t always realize that not everyone wants to be saved, nor do we always know how to do it the right way. Often, though well intentioned, we make a big mess of things. Not all countries are interested in capitalism or equal rights. We should learn a little from our neighbors to the north and stay neutral. Proud. Americans are very proud, often ethnocentric. In my youth, I thought our way was the only way. It took me a long time to appreciate the fact that other cultures, though different, are equally good. I love my country, but I also see the value in a rich variety of cultures. I see that there is much for our young country to learn. We need to step back a bit and reflect on our overbearing presence in the world and embrace the variety of lessons offered to us by others around the globe. Below are the comments left by Danielle’s high school students. Unedited. What it feels like to be a teenager in America? Well to me i feel as if its hard because in order to have a stable life you have to go through a very long process. Starting with Education, than from there its like everyone is trying to compete with each other for positions in a job and when you get the position theres always someone who’s trying to take your place. What I can say is very good about America is that there is a lot of opportunities and you can be whatever you want as long as you put your mind into it and work hard to be successful. We love to see people with talent and theres many programs and associates that can help people with talent get to where they need to be. Whether their good at sports, singing, dancing or ,playing an instrument etc. Another good thing would be theres a lot of rights that us Americans have, which isn’t based on whether your poor, rich, black or white. Which other countries I see discriminate on rich and poor and even race. We all have equal rights here in America. Such as freedom of speech, right to bear arms ( which is the right to carry a legal weapon for protection), the right to remain silence and many others. One thing I don’t like about America is how they treat people with criminal records or just any kind of records period. It’s like once they have this record it follows them for life and people don’t want to hire them, knowing that they may have a family to take care of and living without a job in America is very hard, because theres nothing free specially today in this economy everyone trying to save & earn instead of giving. Being an American.This is how i feel. I feel patriotism, being able to have rights that allow me to do so many different things, i feel compassionate for every other American whose following in my footsteps to become the better of the best. I also feel very well educated, that if i were given a task. Lastly i feel pride, a feeling of deep pleasure and satisfaction derived from my own achievements that i have made throughout my childhood, but I’m sure every American can have a different perspective of the country they live in. I am grateful to be in a country with so many open opportunities. I feel granted that I’ve been able to live my life free of many of the worries that people face everyday such as illness, job loss, or even loosing their house. I feel i am responsible for my two foot prints on the world. What I feel it means to be an american is pride we are a very vain country feeling that we need to help everyone before we help ourselves. We decide for ourselves whether or not someone needs help and if they want it or not we but in sometimes we help but sometimes we make the situation worse. Even though our country is in a economic recession and still there we are focusing on the middle east instead of our home. Corruption is also a problem here the reason we can’t get out of the recession is because our people our so greedy. To our people there is nothing more important then getting the most money possible the easiest and fastest way the banks loaning is the perfect example they gave people loans for houses they could never afford to buy even with the loan and it caused the housing market to fall apart and many people lost their home. This also caused the stock to fall again putting us close to a new economic depression but into a recession. I believe that I take being an American for granted. I have a warm bed, food in my stomach, and parents who care about me. I wake up every morning and take for granted the running water I have. I always have food in my house. And I have plenty of clothes. So every once and a while I have to stop and be thankful for my life and my freedom. Being an American means that we have rights. We have the right to speak freely, vote, and practice whatever religion we want to. Other countries have never had those freedom. Most Americans don’t even know how fortunate we really are. But America is far from perfect. There is still poverty in this country, and people are homeless and Hungry. Rich people are at the top of the food chain and poor people are at the bottom. Lower income places don’t have good education and crime is very popular. Then there is unemployment, so many people in this country don’t have jobs. The Government says that they are trying to fix the problems but a lot of problems seem like they will never change. To me America is something different to me then most. Most Americans would only speak of our good sides and not the bad. I’m not one of those. Forgive me, if I offend anyone, but I speak my mind. America is tail spinning into a crisis it might not come out of, undamaged. Where there is great freedom here there is also great corruption that wants to suppres that freedom. Where the rights exist, some through their greed wish to abolish these rights. The political structure is cracking, the econic circle has broken, and the social ladder distorded. I’ll start off with the corruption, while Russia might have managed to escape the global econimc crisis, America hasn’t. The banking industry, who threiv off of this type of time. Has sought bail-out after bail-out from Washington. Inspite the fact that whe their representives arrived in private jets and Limozine. They got several trillion dollars, which most is just collection dust. The politicans will do just about anything in their power to stay in office. The rights that have been secured since the founding of this nation as stated in the Bill of Rights, while they serpass the rights of many other nations, and under threat. Unlike in China or Taiwan, we can speak out against the goverment and not be killed, the CIA and FBI will just moniter you as a “Possible threat.” Our right to bear arms, have been resritced due to anti-gun laws being rushed through. Activists have kept these mostly intact. As I said greed is a major player here. The rich have all the money while the midle class and the poor lose it. Our econics cricle has broken. There are few jobs left here in industry, most has been sent to China for lower pay, and no qeustions asked. The taxes increase, on the midle and poor and the rich get tax cuts. Also many simple hide their money in offshore banks to afovid taxes. Also with the basics of loans and interest here, many have loans people can simply never repay. In america, we have one of the best educations. We have many children who go above and beyond to further their education in attempt to gain a reasonable career. The education in america is one to be proud of. I learn so many things everyday from the teachers here in New jersey. Like mrs Hartman said, the compassion of every teacher to help us gain an education is phenomenal. In america, we have freedom. Many countries do not have the freedom that we have. I feel that a lot of us take that for granted.Our freedom is something to be proud of. Although, we cannot do anything we feel, our country does give us a lot of leighway such as be able to peacefully protest, and to make many decisions as a democracy. One of our best freedoms is freedom of religion. I myself am Jewish. I believe something other than the average american. I appreciate the fat that I can practice my religion in peace. In america, we have freedom of creativity. We can express our fashion sense or personality in any way that fits us. It makes every one of us unique. we have the right to express ourselves and show everyone who we are without being harmed. Many countries do not have the right to wear what they want or anything at all I feel that we should appreciate the many freedoms we have including one as little as this. In america, I am proud. I am proud to say that i live in america. I feel that just as Mrs.Hartman said, appreciating cultures and how they do things. Many of us do not appreciate the freedom and rights that we have. We should be proud and appreciative of the things we do have and think of those who do not get those same rights. Many people in others countries do not have the freedoms that we do. Being an American means being free, educated, strong, and equal. It is a great honor to be called an American. Here, we have the freedom of speech, religion, the right to bare arms, and to be whoever you want to be. Yes there are a lot of laws and rules and regulations but over all we are a pretty individual country. We don’t have arranged marriages, we don’t have slavery, we don’t have to work at the age if five. I know all of these things seem ridiculous but some other countries have to encounter these harsh and unfair issues. There are so many things that other countries are not aloud to do and so many things that they are FORCED to do. Here, we always have a choice. Over all, America has some really educated people. We may not be the smartest people but we are intelligent. America does everything in its power to insure that everyone has the opportunity to have a good education. Whether its college, a trade school, a tech school, or a GED, a majority of American have some type of education. Im not going to lie, a lot of people don’t graduate from there high school, even more people choose not to expand their education after high school. That, however, is 100% their choice. America gave them the first push, if they continue on the path that is up to them. When you here America you think of strength. Many people say we are strong because of the Army. I agree that our Army is a main factor in America’s strength but the overall reason is because as a people we come together and form a strong nation. 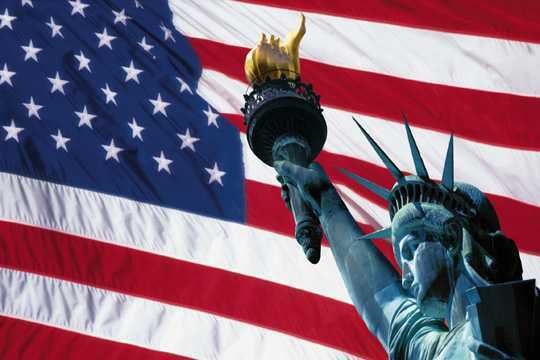 We, the Americans, are the reason why America is seen as a strong country. We have been through a lot. More than a lot. We have come encounter with wars, natural disasters, depressions, recessions, riots, and so much more. At any given time we could have given up. But no, we stood strong and stuck together so that we could overcome all of the obstacles put in our way. Separated we fail, but together we prevail. Equality is the best part of being an American. Especially for someone like me. A female who is African American and Native American. I am in the minority all around. If we didn’t have equality i would have no rights. I am not going to lie, it took a lot if fights and time to form a equal America. But in the end all the fighting, waiting, and time payed off. Now women have the same rights as men. African Americans and every other minority have the same rights as Caucasians. There are still people who believe that some people are still beneath them but you can’t change everyone. I will not lie but it feels good to be an American. To me its the land of Freedom. The fact that us as Americans can fail and get back up and do it again without anybody talking down on us. I love that we can all be classified as equal school wise. I know in other countries kids do not have the same education as we do. I feel that we have fresh food prepared everyday. For me to be an American means a lot because we all have the same rights no matter what class,race,age,gender. For example if i want a job oppertunity at this big CEO company and someone much older is going for the same job choice. Me and the person have to same EQUAL chance of getting that job. I know some countries would have took the older person because that person is older and i know that some other places would have pick me because im younger. Which will bring me to my next point that America is an competitive place to live. If you want a job choice like in my 1st example you have to show the owner/person who is hiring you that you deserve that spot only because there is a lot of people fighting for that same spot. That might be a down fall but it just shows that America does not just give out any job to any random person. If you were to just come to our country you will find out that our country is so divided up into a lot of things. Like our cultures and music. The way we dress would shock a lot of people by surprise just because we dress so differently. Sagging pants,Holes in pants,the shoes we wear,Hairstyles. That type of culture down here is normal because were accustom to it. Food is really different down here too. America is the land of the free and the home of the brave. Yes it feels good to be an American because I could be living in a communist country controlled by a dictator, but America still has many challenges to over come. The quote,”there is nothing wrong with America that cannot be fixed by what is right in America” is an understatement. We have many problems in our country and we do have programs to fix them, but not enough is being done to fix them. In the year 2012 America is dealing with rising proverty rates, high unemployment, debt, job requirements are rising, it’s a buyers and employers market, the cost of a college education is increasing, enormous inflation. Well being an American means many things. Like for example it means that you have more opportunities, freedom, and a better education and rights. For example i was born in south America Chile until i was 4 years old. When i was 4, my family decided to move to the U.S. to find a better future. My dad came 6 months before us to get settled in. Then we can by plane and i cant remember a lot since i was so young. I do remember how everything outside the window looked so tiny and beautiful. When we arrived to the U.S, everything looked and felt different. Like when i left Chile, it was winter time and when i got the U.S. it was summer. As months went by, things changed. Their were many laws and right here that in Chile u wouldn’t even hear about. Everything was different but way better than it was in South America. After i lived here for a year, a tragedy happened in New York. Four planes were taken over by terrorist. Many people died on this day since they crashed them into the towers and the pentagon. Many things happened after that but not as crazy. Living here is harder but yet easier than living in Chile. So we left everything in South America, Chile and my parents had a lot of bravery to start from scratch. In my opinion, its a pleasure to be an American. I feel America has an advantage over so many countries in many ways. Many countries don’t have good education, good food and water supply, and some don’t have a stable government like America. Even though America has problem’s, we strive to come together as one to solve the problem we may face. One of the most important things about living in America is you have Great responsibility. You have to work to be able to maintain some type of property and be able to afford everyday life needs. Also, having a career in some type of field of work. And in order to achieve that goal, you have to attend school such as, High School, or College. Wow, looks like this post is going to be #1 in the mashup series. It’s an impressive bulk of culture insights first-hand, isn’t it?.. If you are British or American and have something to say on it – please do! It’ll be much appreciated.